I’ve always been obsessed with and obsessive about the way I dress. As a kid, I would read and re-read passages of Victorian books about poor little rich girls and their trunks filled with velvet and silk frocks. I’d keep notebooks of my own ‘fashion designs’ and spend hours playing with vintage paper dolls my mum found for me in a second-hand shop. And when I got old enough to have an income to play with, it all went on clothes. I’ve worn mostly vintage since I was a teenager so it’s not like I was fuelling the fast fashion fire, but the more ethical nature of my second-hand purchases - and the fact that many of the pieces were one-offs - made my shopping easy to justify to myself. Most of my salary went to fifties floral frocks, cashmere knits and beautiful quality shoes. For years, I thought the only way to love clothes was to buy them. The result of this is that in my early 20s I always looked great - but my true feelings about my clothes were more ambivalent. They were the source of much of my identity, and I loved hearing people describe me as ‘the girl with all the bright dresses’. But, internally, I skirted around the nature of my buying and the state of my wardrobe, unwilling to acknowledge that it was anything but healthy. And each purchase was one step closer to the dream wardrobe that constantly seemed slightly out of reach. There are many benefits to ageing, like the gray streak that’s emerging in my dark hair, and better self-awareness is one. When I eventually shifted away from this mode of compulsive buying and owned up to having more clothes than a person could possibly need or conceivably wear, it felt good to cull and sell and pare down. And when I got to the stage of having a manageable and, yes, joy-sparking wardrobe, my obsessive nature means I wanted to find a way to catalogue and maintain my wardrobe. I was keen to surface every item to help me understand what I own and wear to help me buy more sensibly in the future too. The result is that my wardrobe now lives in a spreadsheet. I can remember when and where I bought everything I own and how much I paid for it, which is all included. There’s a tab for each type of garment, and the only clothes not included are mandatory basics like tights, undies and gym gear. Each item is described, then the date and price documented, and an estimate of how many times I’ve worn it included. This leads to a cost-per-wear column, with a sum function that means the return on ‘investment’ is clear for each piece. And updating the wear count for what I’ve worn that week is now part of my Sunday routine, like baking a loaf of bread and polishing my boots. There’s a final tab for things I want to buy, which includes the date I decided I wanted it. When I want to make an impulse purchase, I put the details in the sheet and ride the wave of wanting. I usually find that, within two or three weeks, I’m no longer interested and I can delete whatever it was. Chronicling the ebb and flow of my sartorial desires it strangely satisfying, and has proven to me that almost everything I get the urge to buy is a want, not a need. There are so many benefits to this zero-chill approach. I’m extremely conscious of every item I own and whether it’s pulling its weight. 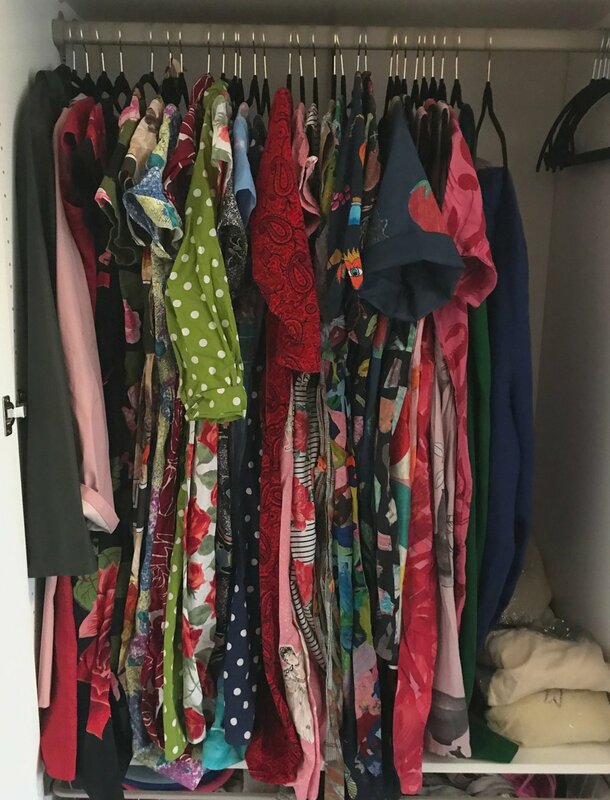 When I want to buy something that I might need to act on immediately, like a charity shop or vintage market find, it’s easy for me to examine whether it has a niche to fill in my wardrobe or whether the colour will go with enough of my other clothes. If I’m seeing a high cost per wear on something for no particular reason, I’ll consider whether it needs tailoring or it’s time to move it on. This level of time and energy investment in clothes certainly isn’t for everyone. But I’ve always been someone who devotes a lot of resource to getting dressed, from hours spent hand-sewing invisible hems to wasting days browsing Etsy for an elusive vintage piece. I’ve spent so long building up and taking apart a wardrobe that feels right to me, and this spreadsheet helps it stay that way. Georgia is a writer from Aotearoa New Zealand, now living in London. She's a lifelong second-hand shopper and general clothes hoarder who recently downsized and lived out of an 8kg backpack while travelling for five months. Georgia is passionate about bright colours, good books and checking her eBay saved searches. You can find her on Instagram @georgiarosemunn.